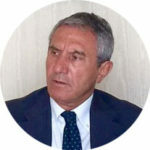 Ambrogio Prezioso, born in Naples, graduation with honors in Civil Engineering, is President of Confindustria Campania and Napoli, and member of national General Council of Confindustria. He was vice-president of Ance (builders’ national association) with study and research centre portfolio. He runs a business group operating in the real estate development and promotion, and Urban regeneration of former industrial areas. He’s CEO of Cittamoderna and other companies, vice-president of Inarch and member of the Board of Regents of Bank of Italy’s Naples branch since 2008.